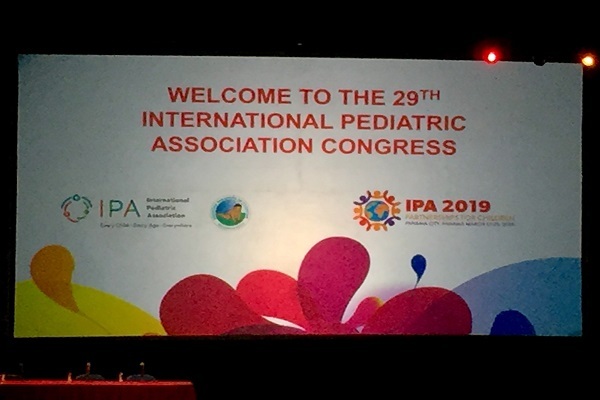 The Chiesi Foundation is back from the International Pediatric Association congress – IPA – that took place from the 17th to the 21st of April in Panama City. Pediatrics, academics and representatives of the international institutions (WHO – World health Organization, UNICEF and UNFPA - United Nations Population Fund) met at the 29th IPA congress to face the challenges and discuss the common strategies in order to protect the health of the most vulnerable. Children and their rights to health, to wellbeing and to develop their greatest skills were at the core of the conference. The SDGs - Sustainable Development Goals – constituted the framework of the congress, the goals and the targets that we have to achieve by 2030 through partnerships and strong collaboration. Report, publications and projects filled the content of the many sessions. A special focus was given to low- and middle-income countries where the neonatal mortality rate is still too high, where the access to quality care for mothers and their children is a challenge that everyone need to face. For these reasons, we need to invest in proper neonatal care for everyone, we have to engage and involve the local governments to reach all the communities and all the remote part: there, where the need is stronger; there, to guarantee health insurance. Furthermore, transforming neonatal care means to change the paradigm of care: shifting from a conventional model to a family-centred approach, which is based on the promotion of a mutually-beneficial partnership among parents, family and health care providers to support health care planning, delivery and evaluation while promoting zero separation between mother and child. The KMC – Kangaroo Mother Care – and its benefits and challenges were at the centre of the congress. The increased awareness regarding the KMC method was also given by the KMotherC or KFatherC challenge promoted by Save the Children. As stated by the UNICEF Chief of Health Stefan Swartling Peterson after having taken the challenge: “It takes a family to do a KMC”. Many sessions were dedicated to children development. The reduction of infant and neonatal mortality does not elude the commitment to the health, well-being, learning and productivity throughout a person’s whole life which has an impact on the health and well-being of the next generation. Early childhood Developmet – ECD – is a crucial theme in nowadays pediatrists’ agenda. The Chiesi Foundation come home with a greater awareness regarding the international context in which the Foundation works and the framework that the international institutions are establishing in order to act in a common direction to achieve the health-related SDGs and its 3.2 target. A congress that confirmed that we are undertaking a right path within the NEST – Neonatal Essential Survival Technologies – project. For this reason, we have to keep working and pursuing our mission because now it is time to act, now we have to make changes.